A body just turned up in the small town of Portland, Pennsylvania. The crime is eerily similar to a twenty-year-old cold case: another victim, brutally murdered, found in the Delaware River. Lead detective Parker Reed is intent on connecting the two murders, but the locals a In this dark, gripping mystery, a brutal murder unearths old secrets that should have stayed buried. To ask other readers questions about River Bodies, please sign up. Becca Kingsley has returned to her hometown after being away for ten years; although she wasn't too far away, she was just across the river. When she receives word that her estranged father is dying, she returns home, mainly for some time away from the troubles in her personal life, but also to say goodbye. Returning home always brings back memories as does contact with those from our past. When Becca returns home, she remembers why she has not returned, becomes reacquainted with those she left behind and walks into a police investigation. A body has washed up- a body that reminds the local authorities of a cold case and a victim that was killed in the same manner. Becca's father was once the Police Chief and her childhood friend, Parker is now the lead detective on the case. The murders, both past and present, open old wounds, bring forth memories, and question loyalties of various characters in the book. I agree with other reviewers who point out that this book is more about relationships, family dynamics, and loyalty more than it is a thriller. As a reader we know more than some of the characters in the book. We are shown various POV's that give us insight and tell us what happened. Yes, there is some mystery here but for me it was about Becca and her relationships with others. We also see several other characters, such as John and Parker and their relationships with others as well. This book also examines loyalty. The choices people make to protect others. A choice a parent might make to protect their child. The choice a member of a group may make to protect the group and to show loyalty. The loyalty (or lack thereof) in intimate relationships. The book looks at what people do to survive and how turning a blind eye happens in the name of survival. I enjoyed the writing and the descriptions in the book. The Author sets the stage for small town life in Pennsylvania near the Delaware river. I found the book to be a fast read but it did leave me wanting more. Maybe I missed something, but I do not feel I was given the reason for the first murder. If I missed it, then that is one me. I wanted more of the rationale and reasons for why one character did things. We do get some explanation and things do make sense, but I also feel there were some gaps in the plot. There was a couple of characters that I wished had been fleshed out a little more. The book is dubbed a mystery, a suspenseful thriller, etc. I feel it would do better if it were marked as a character study on relationships. If you are looking for a book heavy on mystery and suspense, this may let you down a little. I did appreciate how the Author showed how Becca remembered some buried memories, the mystery in the book was really for her to come to an understanding about her childhood, her past, why her father made the choices he did and why she grew up to repeat some patterns she witnessed in her youth. This is the first book in a series and I believe that the characters will be fleshed out more in the next book. Overall this was an enjoyable read that although did not have me on the edge of my seat, I was intrigued and wanted to see how the book was going to end. The Author drew me in with her descriptions and hints at buried secrets. I found this book to be on the lighter side. For me it was not a heavy book, the reader knows whodunit, so there is not much need to do any detective work while reading, it was nice to kick back and enjoy the book. For some there might be a scene or two that is a little cringe worthy but otherwise the book dealt with the characters and their secrets. 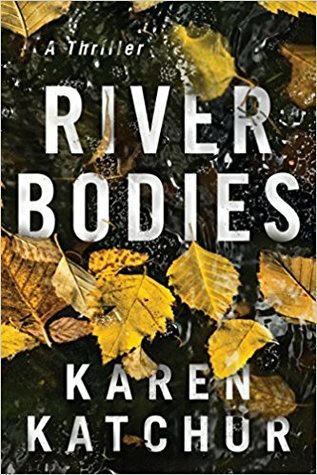 I received River Bodies, a new novel written by Karen Katchur coming out in fall 2018, through NetGalley. Besides having a gorgeous cover and an interesting title, the premise was intriguing enough for me to say yes when the publisher offered it. I'm glad I did as it had a wonderful balance of mystery and good old-fashioned storytelling. The book is told from the perspective of several different characters across a county on the Pennsylvania and New Jersey border. Bodies have been found over seve I received River Bodies, a new novel written by Karen Katchur coming out in fall 2018, through NetGalley. Besides having a gorgeous cover and an interesting title, the premise was intriguing enough for me to say yes when the publisher offered it. I'm glad I did as it had a wonderful balance of mystery and good old-fashioned storytelling. The book is told from the perspective of several different characters across a county on the Pennsylvania and New Jersey border. Bodies have been found over several years in the river. It's widely known that Scion 'gang' are responsible, but it's not always what it seems. Two different chiefs of police, daughters of various members, step-families, affairs, and mysterious connections lurk in the background. It's quite a puzzle, and you're never sure who is protecting whom. The writing style is strong. It is very descriptive but never too much. I feel like I know the area well (I also lived not too far from it and understand many references, e.g. shootings in Easton). It's the type of book where I enjoyed the read but didn't care for the characters. They were well-written, but as people none were appealing given how they talked or what they believed in. At the same time, it's a very real part of society and deserves a spotlight. It showcases how different experiences and areas to live in shape who we are. Surviving is tough when you have less support from those around you. Katchur brilliantly shows these aspects and helps you connect with someone you might not normally be around. It sounds odd to say it in this way, but it's the best way to describe how I felt while reading the book. Example: sworn oaths to protect and kill for the sake of the group, an eye for an eye, revenge even if you get caught... it happens in reality! Becca returns to her hometown of Portland, Pennsylvania, to be with her dying father. Becca has been living just across the river in New Jersey, but hasn't been back to Portland to visit her father or old friends for 10 years. Her arrival in town coincides with a murder that is very similar to an unsolved murder that occurred 20 years earlier in the same town. Becca's old friend Parker, who is now a detective, works to uncover who is behind the deaths. Meanwhile, Becca confronts old secrets in h Becca returns to her hometown of Portland, Pennsylvania, to be with her dying father. Becca has been living just across the river in New Jersey, but hasn't been back to Portland to visit her father or old friends for 10 years. Her arrival in town coincides with a murder that is very similar to an unsolved murder that occurred 20 years earlier in the same town. Becca's old friend Parker, who is now a detective, works to uncover who is behind the deaths. Meanwhile, Becca confronts old secrets in her and her father's pasts. Different viewpoints are used to tell the story, but Becca is the main character, and most of the story revolves around her. Becca is in a relationship with a man she has doubts about, she is estranged from her father, and she misses her old best friend Parker. Becca's father is on his deathbed, but he was once the police chief in Portland. The law enforcement in town has a delicate relationship with the town biker gang, the Scions. When Becca's father was police chief, his stepbrother was the leader of the Scions. The stepbrother is now deceased and there is a new police chief, but old loyalties still remain, though some secrets are difficult to contain. This is a mystery because of the murders, but it's also a story about relationships. The descriptions of the area, the people, and the lifestyles are very well done. The characters are not particularly likable, but they are real. While the story does not have a lot of action, the various relationships between the characters is gripping. Sometimes it’s nice to mix things up within a genre, so many times I’m craving a fast paced and exciting thriller with twists and turns galore and then other times I’m in the mood for a really well written slow burn, and River Bodies fits the bill perfectly. It’s funny because the pacing itself wasn’t even slow at all, but the writing style and the way the story unfolded was more subdued so it was almost a mix between the two. Either way it worked well for me and was an intriguing read. This was Sometimes it’s nice to mix things up within a genre, so many times I’m craving a fast paced and exciting thriller with twists and turns galore and then other times I’m in the mood for a really well written slow burn, and River Bodies fits the bill perfectly. It’s funny because the pacing itself wasn’t even slow at all, but the writing style and the way the story unfolded was more subdued so it was almost a mix between the two. Either way it worked well for me and was an intriguing read. This was character driven and really focused on the relationship between Becca and her estranged father, but also between Becca and her longtime boyfriend as well. Besides Becca you also hear from Parker giving it a subtle police procedural vibe and then John, a local outlaw who is part of a biker gang. All three were complicated and interesting and I just saw on Goodreads that this is the first book in a new series with the next installment set to be released next summer! I’m a sucker for old cases and new ones colliding and there was plenty of that here. Throw in some fantastic and evocative writing and a tricky mystery and I was all in. Recommended for those looking for a rich, character driven story with a great setting and a few surprises along the way. River Bodies in three words: Subtle, Layered and Engrossing. Listed as a thriller, “River Bodies” beckoned with all the usual temptations the genre offers. I hoped that author Karen Katchur would deliver more than the same tired clichés that normally accompany a book about returning to the old home town during a murder investigation. It wasn’t the writing style that caused me to lose connection with the book. Ms. Katchur delivers in this area, serving up a prose that describes as well as illuminates, peppering her words with images that at times felt more Listed as a thriller, “River Bodies” beckoned with all the usual temptations the genre offers. I hoped that author Karen Katchur would deliver more than the same tired clichés that normally accompany a book about returning to the old home town during a murder investigation. It wasn’t the writing style that caused me to lose connection with the book. Ms. Katchur delivers in this area, serving up a prose that describes as well as illuminates, peppering her words with images that at times felt more than real. This is her five-star element. Rather, it was the inconsistencies in the plot elements that caused questions to form and to drag me out of the book each time one of them appeared. Our heroine Becca lives just across the river from her home town, close enough that she can identify minute clothing details of someone standing on the other side. While I might be able to accept that she had reasons never to return home (even with it being so close), that didn’t excuse the fact that while she wouldn’t cross the river’s bridge, many others living in the town probably would. However, no one had seen her for years (except for her cousin John, who she “met” regularly when she spotted him on the other side of the river. The small town of Portland is home to not one, but possibly two decent-sized (more than twenty-five) motorcycle gangs. Possible, but not probable, and with the closest large city hours away, the probability is further reduced. There are more inconsistencies, but I hesitate to list them all without revealing portions of the plot. Characterizations were good, providing enough background to justify each character’s actions. Everyone, that is, except for the killer. After establishing justification for the most recent killing, the killer’s reasoning abruptly changed, and it didn’t fit with some of the other important scenes in the book. This flaw was large enough to leave me shaking my head during the last part of the story. Overall, good story and a wonderful writing style, with Ms. Katchur deftly switching between past and current events, slowly revealing bits and pieces until the entire tale is laid out in front of us. Some of the plot elements were ragged, pulling the story down from potential heights of greatness into something that is still better than many of today’s offerings. Three-and-a-half stars. Check out my Q&A Elevator Ride with Karen Katchur. Learn the inspiration behind this "standout" new thriller series and some fun and interesting facts about the author. (Thanks Karen, FUN FUN). An emotionally resonant tale of fury, tragedy, guilt, and redemption. The first in this exciting new series: Northampton County —A page-turning, psychologically rich, both "character and plot-driven," a gritty multi-generational, complex suspense thriller of two brutal crimes twenty-years-apart. The past and present connect when a murder investigation with the same MO reconnects old childhood acquaintances and estranged parents, while dark family secrets threaten to destroy present lives. — Taut prose, flawed characters, and a dark side that weaves through the lives of the small towns of Northampton County, with the introduction of this new bold series. The author creates a strong sense of place positioning itself ideally for the setting of this intriguing new series leaving readers anxiously awaiting the next addition. An edgy, intense, deep and darkly compelling psychological suspense “whydunit” thriller with plenty of attention to detail. Katchur skillfully explores the frightening and gut-wrenching mental state of each character. The journey from past to present, the traumas and fears bringing them to the present nightmare as they confront their monsters. Set in the small rural town of Portland, Pennsylvania in the autumn season, alongside the Delaware River banks with small connecting towns in Northampton County: Pennsylvania and the Jersey side. Becca Kingsley was born here, the daughter of the controlling and demanding police chief, Clint. Her childhood does not hold fond memories. Becca now is a grown woman, age thirty, single and living with Matt, a patent attorney who is cheating on her. She is a runner, a veterinarian, and the owner of Romy, her faithful and much-loved German Shepherd. Her practice is in Columbia, NJ not far from her hometown. She has always loved animals. They were of comfort to her during her turbulent childhood. A demanding father, a womanizer, and never faithful to her mom which he drove away. Years ago, a scared child, she stumbled upon something that frightened her. She happened to be at the wrong place at the wrong time. She tried to tell her dad, but he instructed her never to speak of this again She carried this secret and buried it deep in her mind. Did her father send her away to protect her from harm? She did not know why. She never understood. Her mom and dad separated. Now her dad is dying. They are estranged. Her mom thinks she should visit him before he passes. Could her dad hold the secret to the murder long ago and the one in the present? John Jackson (very complicated) was older than her by fifteen years. He had been a part of her childhood. John’s dad Russell was a stepbrother to her dad, Clint. John had a troubled youth as well. He is a hunter. His dad was part of a motorcycle club (gang) called the Scions. His dad had no patience for mistakes and no tolerance for the cowardly. John had no children and his late wife, Beth died of cancer three years earlier. Two stepbrothers on different sides of the law. John had taken an oath to the club, twenty years ago and if there was one rule he lived by, the rule his old man, Russell had drilled into him ever since he was a small boy. It was that he put the club before himself, always, even if it meant giving his life. Now John answers to his father’s buddy Hap. John is a product of his environment. Could he have been a different person without his father’s influence? Detective Parker Reed is a State Police homicide investigator who works cases throughout Northampton County. He is from Portland, and he and Becca were childhood sweethearts. Now in charge of the current case, and recalls the twenty-year-old case from previous years when he was a child. Will he be able to solve the crime before there is more collateral damage? Twenty years ago there was an unsolved murder of a man. When the man’s body is pulled from the Delaware River, he had been shot, gutted, and field dressed as a deer. Now there is a similar murder. Could it possibly the same murderer? A copycat? What is the motive? Becca, John, Parker, and Clint are connected to the murder. How? The past refuses to remain buried. Becca has been summoned to her hometown. Her dad is dying. He has a lady friend, Jackie. Becca swore she would never return. She had never understood her father’s reasons for doing the things he had done. Her father did not like John nor did he get along with John’s father Russell, his stepbrother. Filled with dread and fear, when she returns, she happens to once again be a part of the new crime. Will the new crime bring back the memories she has kept hidden for years and reopen old wounds? Could she be in danger? Does she know too much? Why was this brutal murder so violent? What would make a person skin a human as an animal? Do humans repeat learned behavior? There is much to love here! Karen takes us below the surface of the human psyche. Good versus evil. With literary prose, there is the constant pull between fear, danger, protection, and love. Water, the river, the woods, and nature can be beautiful, but at the same time, it can be dangerous, as with animals and humans (we find here). A twisty, unsettling, yet captivating thriller explores the relationships between fathers and daughters, and fathers and sons. Highly charged topics: psychological, repressed memories, secrets, fear, parents’ effect on a child’s behavior, as well and marital relationships, infidelity, narcissism, violence, forgiveness, fear, control, protection, old loves, love of animals, betrayal, friendship, love, loss, cancer, and grief plus more. As with all her books, the author skillfully explores powerful, complex and high-charged topics and emotions. The intricacies of parent-child relationships and family dynamics. I enjoy the intriguing tie in with animals, nature, and the rich settings in her books as well as the "whydunit," versus the "whodunit." A type of detective story in which the focus is not on who committed the crime, but what were their motives for committing it. I love her book covers and her keen sense of place with her bold and alluring settings which draw you in. For those fans of true-crime, families are torn apart by secrets of the past. Why? This is the ongoing question and the focus of RIVER BODIES. The author delivers a complex and gripping standout thriller! Written from different points of view and time periods, readers will be glued to the pages —anxiously awaiting the next in this riveting series. Perfect for crime fans of Lisa Gardner, Karin Slaughter, Harlan Coben, Gilly MacMillan, and Lisa Unger with a mix of emotional domestic suspense/literary of Heather Gudenkauf, Mary Kubica, Randall Silvis, Diane Chamberlain, and T. Greenwood. RIVER BODIES is prime for the big or small screen! (fingers crossed). Engrossing, unsettling, and atmospheric. Katchur has outdone herself, and River Bodies is her best yet! The author knows how to write gripping suspense while also delving deep into her characters’ minds and the darker parts of the human psyche, drawing on her background in criminal justice. A dark and twisted well-researched multi-generational tale with a meticulously-woven plot, multi-layered complex characters, with psychological depth. A “must-read” new series. An ideal selection for book clubs and further discussions. 5 Stars + Top Books of 2018 list. • An Elevator Ride with Fun Facts about the Author. Readers, you are in for a treat, Cold Bones #2 Northampton County is coming 2019 with more from Detective Parker Reed and his new partner Geena Brassard. Looking forward to learning about his past. Cannot wait! 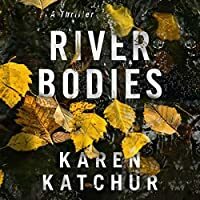 River Bodies by Karen Katchur was a slow burn of a novel that I didn't consider a mystery or a thriller, but I still enjoyed it. It all sounds very mysterious but you basically already know who the killer is, even though you do get a twist thrown at you towards the end. I liked the pacing of the book and it was a fast read, but I didn't get thriller out of it. I was at no point on the edge of my seat while reading this, and even the secrets from Becca's past aren't all that shocking. I also thought there were some unanswered questions that bothered me, but maybe the author meant to do that since this book is the first of a series. River Bodies is also part police procedural as we get the viewpoint of Parker as he is trying to solve the murder and figure out how it ties to the cold case. The small-town mentality was interesting to read about, especially when it came to the biker gang presiding over the town - The Scions. Townspeople don't want to talk, there are dirty cops, and there is a general sense of fear over the townspeople. I think that Katchur did a really good job at setting the scene and the characters, but maybe there were too many viewpoints? I really disliked that there wasn't much of a mystery to it when that is what I was expecting. Then why did I give it a 4/5? Because the pacing is quick, I read it fast, I was fully invested in the story even though I didn't think the mystery was great, and the ending has me wanting to read the second book. The story of a young woman returning to the town where she grew up to spend time with her dying father and who is forced to return to the deep-dug memories is well conceived and easy to follow. A murder is committed which resembles a similar one that happened when Becca was a child and now she has to identify the true nature of a person she considered to be her protector. Apart from the plot, I enjoyed reading about Portland, a small town where loyalty goes first. The Author knows how to depict The story of a young woman returning to the town where she grew up to spend time with her dying father and who is forced to return to the deep-dug memories is well conceived and easy to follow. A murder is committed which resembles a similar one that happened when Becca was a child and now she has to identify the true nature of a person she considered to be her protector. Apart from the plot, I enjoyed reading about Portland, a small town where loyalty goes first. The Author knows how to depict the atmosphere of such places. For me, it was not a page-turner, however I do not regret time spent reading this title. Secrets that span generations take the forefront in Katchur’s debut, River Bodies, and nearly 20 years apart, dead bodies are found with alarming similarities. In a town where motorcycle gangs have police on their payroll and the lines are seemingly blurred between the good guys and the bad guys, lies Becca, the daughter of the former police chief who has returned home to spend the final days of her father’s life with him. For fans of Allen Eskens, those who enjoy a slow burn with a lot of chara Secrets that span generations take the forefront in Katchur’s debut, River Bodies, and nearly 20 years apart, dead bodies are found with alarming similarities. In a town where motorcycle gangs have police on their payroll and the lines are seemingly blurred between the good guys and the bad guys, lies Becca, the daughter of the former police chief who has returned home to spend the final days of her father’s life with him. For fans of Allen Eskens, those who enjoy a slow burn with a lot of character development over action and old secrets coming to light, this one is the book for you! Susanne Strong Nice review Jamie! Mike Great little review, Jamie. Intrigued by your comparison to Allen Eskens. This definitely sounds like it's in my wheelhouse. This book grabbed me from the very first page and kept me highly on the edge of my seat. Lots of dark secrets throughout the book leading to the twist at the end. I liked how the author put in her many details along the way. It’s a quick read and I read it in 2 days. In the small town of Portland, a body is found. The crime is similar with a cold case from twenty years back.. nice thriller, I couldn't let it go. Thanks Netgalley for this thrilling story, the first book from Northampton County series. RIVER BODIES is a dark, fast-paced, and gripping suspense with characters you won’t forget. It’s filled with old family secrets designed to protect but that instead pull everyone apart. A must read! This book confused my feelings in all sorts of ways! First off if there was one word I could use to describe how this book made me feel it will be melancholy. But don't get me wrong I was totally engaged and the writing was so good. But the real question is did I like it? I did and yet I didn't... Like I said it was a good book but it just downright depressed me. I also felt disconnected from the characters. Actually, I felt disconnected from the whole book. Yet again engaging read... There are just some books that you can't explain with words and for me River Bodies is one of those books. River Bodies is a compelling and dark mystery that shifts from a present day murder to one that happened 20 years ago. The setting is vivid and evocative, the forest and the river lending a fantastic atmosphere to the story. When Becca catches her boyfriend cheating on her, she returns home to take care of her terminally ill father, whom she’s been estranged from since he sent her away when she was young. While she’s taking care of her father, a murder takes place near her town that has eerie sim River Bodies is a compelling and dark mystery that shifts from a present day murder to one that happened 20 years ago. The setting is vivid and evocative, the forest and the river lending a fantastic atmosphere to the story. When Becca catches her boyfriend cheating on her, she returns home to take care of her terminally ill father, whom she’s been estranged from since he sent her away when she was young. While she’s taking care of her father, a murder takes place near her town that has eerie similarities to one that happened 20 years ago. The story isn’t really a whodunnit, as we already know who did it. It is an intricate exploration of how the murders – past and present – affect one family. The tale started out slowly for me, and I almost set it down. Becca Kingsley lives on the New Jersey side of the river with her boyfriend just minutes from the animal clinic where she works as a veterinarian. As she makes her morning run along the river, she feels as if someone is watching her. It’s a man she knew as a child. He often watches her, but today he is down by the river and something looks strange. Becca has other things on her mind, like that the fact that her boyfriend is cheating o The tale started out slowly for me, and I almost set it down. Becca Kingsley lives on the New Jersey side of the river with her boyfriend just minutes from the animal clinic where she works as a veterinarian. As she makes her morning run along the river, she feels as if someone is watching her. It’s a man she knew as a child. He often watches her, but today he is down by the river and something looks strange. Becca has other things on her mind, like that the fact that her boyfriend is cheating on her again. A phone call soon sets this matter aside as Becca learns her estranged father is dying and asking for her. Becca soon finds herself back in Portland, in her childhood home (just across the river). The tale that unfolds brings back buried memories, re-acquaints her with her childhood crush and unknowingly places her in danger. I didn’t have a sure footing in the beginning of this tale and worried I would not like Becca. I loathe cheaters and struggled to understand women who deal with them. Thankfully, we quickly moved on to her father dying and a current murder-mystery that is strikingly similar to an unsolved case. Katcher provides us with Becca’s point of view and that of the killer. We are also privy to the past as Becca reflects and remembers events from her youth. The town is home to a motorcycle gang known as the Scion. The townsfolk sidestep them, and at one time their leader, was the chief-of-police (Becca’s father). Becca’s Dad has since retired but holds secrets. It was an interesting tale, with a love interest, troubled childhood, and character growth. Secrets and repressed memories resurface providing suspenseful moments. Becca’s childhood friend and teen crush, Parker, is now a homicide detective and lead on the present day murder. He also looks back at the original murder. Both were gruesome, and forensic shows a unique signature for the killer. When Becca was a child a murdered man was found in her local river. Now, years later, she is back in her hometown and thinks she has seen something suspicious. Could it be linked to the murder that has just been committed, and is that linked to the murder of years ago? Becca doesn't trust her boyfriend, so visits her dying estranged father to give herself a chance to think. Whilst out in the local woods Becca sees something, which means nothing to her at the time but later on niggles at her mind, and brings back long forgotten memories of the past. Meanwhile she gets back in contact with her old best friend Parker, who is now investigating the recent murder, and Becca discovers her feelings for Parker are still there. Set around Portland, Pennsylvania by the Delaware River there's plenty of interesting themes in this murder mystery, including the local bike gang who seem to run the small town, relationships based on love and others not so positive, and of course the mystery of what happened recently, and whether it is related to what happens all those years ago. 3*s from me, as though I enjoyed reading this book, I never really felt involved in the characters and action. Wow, this book pulled me in from the first chapter through to the end. It's a story that brings together both the past and the present with two dead bodies and one killing style that can't be forgotten. A town that is known to live peacefully (as much as you can) with a gang. The Scion's take care of the people and the people stay hush about their business until one day when a young woman returned to town to say goodbye to her ailing father, the retired head of the police department. Memories she Wow, this book pulled me in from the first chapter through to the end. Memories she didn't recall start coming back little by little. Her feelings for Parker begin to become stronger and stronger. Others begin to realize that the story of the morbid past may come to the surface and the Scions can't let that happen. Will Becca be able to save her own life? Will Parker be able to get justice for a double murder? The answers will all come to light November 1st. Karen Katchur, Author of “River Bodies” has written a suspenseful, captivating, intriguing, intense, riveting, and thrilling story. The Genres for this novel are Fiction, Mystery, Suspense and Thriller. The author describes her interesting characters as complex and complicated. Karen Katchur had me sitting at the edge of my seat. There are twists and turns, betrayals , danger, secrets and murder. The timelines of the story is set both in the past and the present. The common denominator seems to Karen Katchur, Author of “River Bodies” has written a suspenseful, captivating, intriguing, intense, riveting, and thrilling story. The Genres for this novel are Fiction, Mystery, Suspense and Thriller. The author describes her interesting characters as complex and complicated. Karen Katchur had me sitting at the edge of my seat. There are twists and turns, betrayals , danger, secrets and murder. The timelines of the story is set both in the past and the present. The common denominator seems to be the Delaware River. Becca Kingsley , is a veterinarian that loves to run by the river with her dog. She often feels that she is being watched and realizes that her step-brother is watching her from the other side of the river. The step-brother seems strange, quirky, and dangerous and is now the head of one of the gangs in his town. Becca is called home to the other side of the river when she gets news that her father is dying of cancer. Becca and her father were on terrible terms, and this might be the last time to make things right. Becca also sees that her former love, Parker Reed, a detective is involved in a case where a body was found by the river. This reminds all the townspeople of a similar case 20 years ago, where another body was found by the same river. The local people stay very quiet and don’t want to talk. The town consists of the regular people and the gang. The club. The power and control that a certain few have over a small town spreads an insidious evil over the years. What small Becca saw as a child leaves an impact of trauma on her and her relationship with her father. This story is edgy, creepy and emotional as Becca weaves through memories and the discovery of a new River Body. A must read thriller! This was my pick for my free Amazon Prime 'first reads' (or whatever they call it) for October. Not a great set of choices this month - especially with 1/3 of the books being for children. Geographically speaking, Becca hasn’t strayed far from her childhood home, living just 15 minutes away on the other side of the river. Emotionally and familiarly though she’s a million miles away. It takes catching her long term boyfriend cheating with other women to send her back ‘home’ to her terminally ill This was my pick for my free Amazon Prime 'first reads' (or whatever they call it) for October. Not a great set of choices this month - especially with 1/3 of the books being for children. Geographically speaking, Becca hasn’t strayed far from her childhood home, living just 15 minutes away on the other side of the river. Emotionally and familiarly though she’s a million miles away. It takes catching her long term boyfriend cheating with other women to send her back ‘home’ to her terminally ill father and his terminally supportive lady friend. Becca’s been gone so long she can no longer remember why and how she left but her past comes back to haunt her is many different ways. A dead body, eviscerated in the style of a huntsman’s ‘kill’ is found in the river that separates Becca’s old and new worlds, in Pennsylvania and New Jersey. Everybody seems to just ‘know’ it’s somehow related to a similar killing many years before when Becca was still a child. Back in Portland, Pennsylvania not everything she left behind comes with bad memories and she’s keen to get to know her childhood friend Parker (he’s male – I honestly just don’t get why Americans love giving their kids asexual first names that are really surnames) who works for the local police department. Can she take a friendship forward into something more whilst handling the demons of her past and the cheating boyfriend of her present? This is a competent but not particularly challenging murder-mystery – though perhaps the mystery tag is inappropriate since we know ‘whodunnit’ and we’re neither particularly challenged nor particularly enlightened about ‘whyhedunnit’. The mystery part is perhaps how Becca has buried memories that might have made the ‘reveal’ even quicker. I enjoyed the small town menace of the storyline – the biker gang that everybody is scared of and nobody talks about, the open secrets that can’t be prosecuted because nobody will tell them, the undermining of law and order in order to keep a strange and strained type of peace. It’s a fast read – lots of quick snappy sentences that keep things moving along at a high pace and relatively simple relationships between people without too much cause for confusion. Is it ‘great’ murder mystery? Not really but it’s OK and it does the job. The past and present passages are well distinguished so that the reader rarely gets muddled about whether they’re reading now or then. For me the motivation for the two murders seems a little weak, the involvement of a third-party that comes out at the end is a bit forced and not particularly intuitive, and there aren’t too many surprises in the final chapters. I liked the characters well enough but didn’t get the cold shudder of suspense or the surprise of unpredicted outcomes that I associate with the best of this genre. River Bodies by Karen Katchur is a so-so novel about relationships rather than a murder mystery. It is not a thriller. Becca Kingsley lives across the Delaware River from where she grew up in Portland, Pennsylvania and where her estranged father still lives. After his constant cheating on her mom, his decision to send her away to boarding school, and her parents' divorce, she hasn't seen him for years. Now she is a veterinary surgeon on the New Jersey side of the river where she lives with her be River Bodies by Karen Katchur is a so-so novel about relationships rather than a murder mystery. It is not a thriller. Becca Kingsley lives across the Delaware River from where she grew up in Portland, Pennsylvania and where her estranged father still lives. After his constant cheating on her mom, his decision to send her away to boarding school, and her parents' divorce, she hasn't seen him for years. Now she is a veterinary surgeon on the New Jersey side of the river where she lives with her beloved dog Romy and her cheating boyfriend, Matt. Occasionally she sees a relative watching her from the Pennsylvania side when she is out for a run with Romy. When she learns from her mom that her father is dying and Matt cheats on her, again, she takes off back across the river to see her father who is being taken care of by his current girlfriend. At the same time a body is found downstream, shot and gutted, like a deer. The body resembles a case her father had twenty years ago, when he was the police chief. It seems that both cases may be tied to the local biker gang, the Scions. When her high school boyfriend, Parker Reed, shows up as the Pennsylvania State Police lead detective on the murder case, she begins to rekindle her feelings for him. But Becca has more clues to the answers to solve both cases than she is admitting. The technical quality of the writing is good, so I have no qualms with that. The plot, however, is another story. The narrative alternates between what happens to Becca in the present and what happened in her past. This is not a murder mystery. You know the guilty party immediately and you pretty much know who was guilty twenty years ago. There is no motive given, but it's not pertinent to the novel. What it is, however, is a story about lying, cheating men and the women who put up with them until someone else arrives to save the day. I guess now is the time to admit that I didn't care for Becca and had little patience for her. I simple never connected to Becca and felt very little compulsion to finish the story, other than a commitment to read and review it. Becca needed some introspection and backbone. After all the flashbacks to her cheating father, she should have dumped Matt, no matter how good looking he was (seriously?) the first time he cheated. There is no need to go on; 1 star for the book, 1 for decent writing. Read this only if you like some lite-mystery around a sort-of romance novel. Disclosure: My review copy was courtesy of Thomas & Mercer. This was the "Thriller" selection for Amazon's October First Reads books. I'm not quite sure when the thrill was supposed to set in. This book is about a motorcycle gang, the daughter of a police chief, corruption, murders and yet it was predictable and a bit boring. There was no mystery as to who committed the murders and the characters were bland. The plot had promise, as all plots with repressed memories do but this one fell short. The book was a quick easy read, but there were so many plot holes that I got to be painful. I was disappointed at the underdevelopment of characters and motives. This review has been hidden because it contains spoilers. To view it, click here. To begin with this book seemed like it would be a good murder mystery but I have to say as it went on I just didn't really get it. The motivation for the murders was never really established, the murderer was known throughout most of the book but the weird relationship between him and Becca was never really delved into properly. I just finished the book feeling completely underwhelmed and at a bit of a loss as to what it was actually all about. Bit disappointed to be honest. The characters were d To begin with this book seemed like it would be a good murder mystery but I have to say as it went on I just didn't really get it. The motivation for the murders was never really established, the murderer was known throughout most of the book but the weird relationship between him and Becca was never really delved into properly. I just finished the book feeling completely underwhelmed and at a bit of a loss as to what it was actually all about. Bit disappointed to be honest. Karen Katchur is an award-winning suspense novelist with a Bachelor of Science degree in Criminal Justice and a master's degree in Education. She lives in Eastern Pennsylvania with her husband and two children.